What child does not want their own EXIT playhouse? A great place to play in the backyard with your brother or sister, boyfriend or girlfriend. With bright colors, this imaginative playhouses are the dream of every child from three years. An EXIT Playhouse is slightly sharper priced than the other playhouses. But no less imaginative or beautiful. Look for example at the EXIT playhouse Tipi! 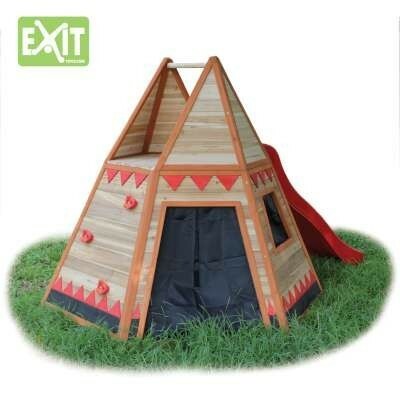 The EXIT playhouses are made from cedar wood dried. This is a special kind of wood because it is naturally resistant to weathering and moisture and is resistant to rot. The cedar wood is therefore not dealt with unhealthy chemicals, such as that in pine or spruce it is often the case. Cedarwood is good for the environment and safe for children. The panels are already painted with a water based stain. The EXIT playhouses comply with the currently applicable safety standards (EN-71) so as to ensure safe fun. The EXIT playhouses are constructed from prefabricated panels, including installed doors and windows. A real Prefab system therefore, easy to assemble! Click here to go to the wood (EXIT) playhouses!